My attempt to be perfect almost kept me from today's picture. On Day 518 I cut out 99 Christmas stockings for Stockings for Soldiers. On Day 544 I took all the scraps left over from cutting those stockings and sewed them into strips with the intent of making patchwork stockings. And today, after looking at the finished product, I almost didn't turn them into stockings. But I looked beyond my need to impress others and looked at the needs of others. Those scraps allowed me to make six more stockings, stockings that six soldiers wouldn't have received otherwise. 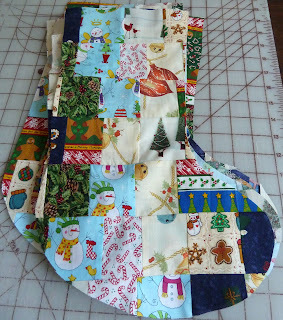 With these six new stockings I have even more - even smaller - scraps. More stockings perhaps?